With the demotion of the B(K).1A to tanker trainer duties, several B.1A aircraft were also brought back to service without the tanker modification, for use as crew trainers with the Tanker Training Flight, and 232 Operational Conversion Unit. In August 1966 HP tendered design studies for upgrades to both the Mk.1 and Mk.2 Victors to increase both capability and extend service life. Both the K.1 and K.1A were to be modified to the same standard. As the Mk.1 wing was not designed to carry the Mk.2 slipper tank, additional fuel capacity was to added with wingtip tanks similar to those originally posited for the Phase 6. The tiptanks would also significantly decrease wing stresses and increase the fatigue life of the Victor. Additionally, as the engines could not be upgraded to higher powered models, the Mk.2 Kuchemann carrots were to be fitted - but modified to carry smaller jet engines as thrust augmenters. To increase the range or mission time of the SR.2, and to increase the aircraft's fatigue life, the same wingtip fuel tanks as for the K.1 were to be added. 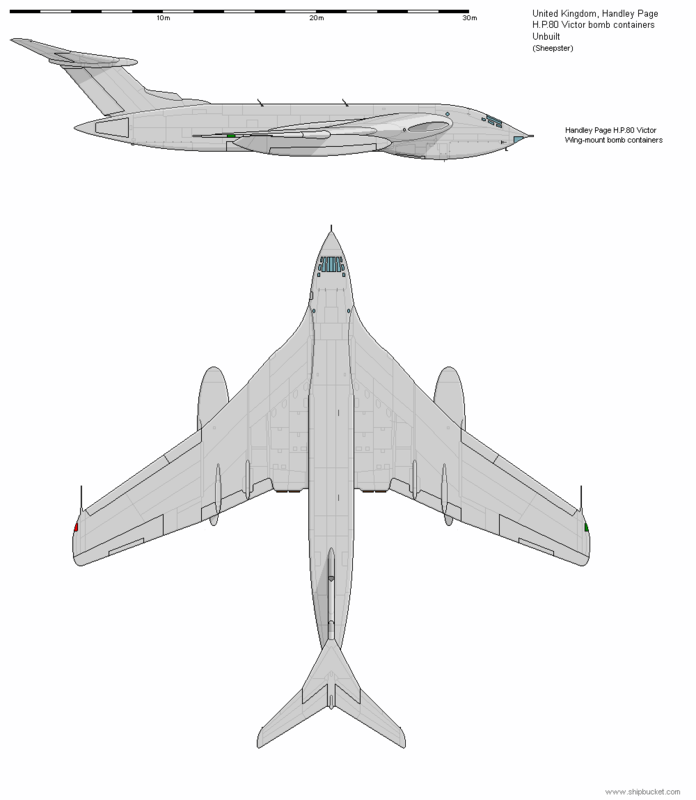 With the introduction of the K.1/K.1A tankers and with the B.2 and SR.2 still on active service a tanker conversion of the Victor Mk.2 was not an initial priority. Nevertheless HP provided a design for a K.2 three-point tanker. The aircraft was to feature the Mk.2 slipper tank in a non-removable fitting and the wingtip tanks for additional fuel capacity. Again, the wingtip tanks would significantly improve the life of the wings by reducing wing fatigue. As committed tankers the nose glazing for the bombardier's position would also be blanked out. However, after this point the British government's disasterous aviation policy destroyed Handley Page, and these three design advancements were not constructed. The government had decided that there were too many independent aviation companies in Britain, and so embarked on a policy to force the amalgamation of the companies. This led to a point where RAF contracts would not be awarded to companies that were not "playing the game" and merging. The Hawker Siddeley group purchased Avro, so that the Avro 748 became the HS 748, and De Havilland, with the DH125 Jet Dragon becoming the HS 125, and made overtures towards also purchasing Handley Page. The price offered though was considered to be well below value, and so negotiations faltered. Without military contracts, civilian income was not sufficient to keep the company afloat, and in early 1970 HP went in to voluntary liquidation. Excellent additions, I had never come across a couple of these projects before. What were the booster jets on the tanker retrofit? Vipers? The engine planned was the Rolls Royce RB162 or the developed version the RB181. This was the small VTOL engine developed as the lift engines for the Dornier Do31, and used as a take-off boost engine in the Trident 3B - in a similar style of application as that planned for the Victor. The final Victor marque, the Mk.2 three-point tanker. With the demise of HP, the K.2 tanker programme was instead awarded to Hawker Siddeley, and specifically the division that had been Avro. With no working experience of the Victor, the HS Victor K.2 was a different aircraft than that originally planned. The most notable difference being that HS did not proceed with the tiptanks, but instead chose to reduce the wing span by clipping the wingtips. HP had initially investigated this option but had rejected it, with the tiptanks being more effective at reducing wing fatigue and promising a significantly increased potential service life for the aircraft. While the conversion removed the nose glazing as a bombadier was unnecessary for a tanker, some aircraft were modified in service back to being glazed for airborne photography purposes. Both SR.2 and B.2 aircraft were modified to become K.2 tankers. Initially being painted in the standard camouflage colours with white undersurfaces, after repainting after heavy maintenance in the late 1970's aircraft started to use light grey below. There doesn't seem to be any info on which Victors received this colour change, and from a perspective of 40 years it is very difficult to spot a photo of a grey surfaced aircraft versus a dirty white aircraft - so I have not modeled this colour combination. 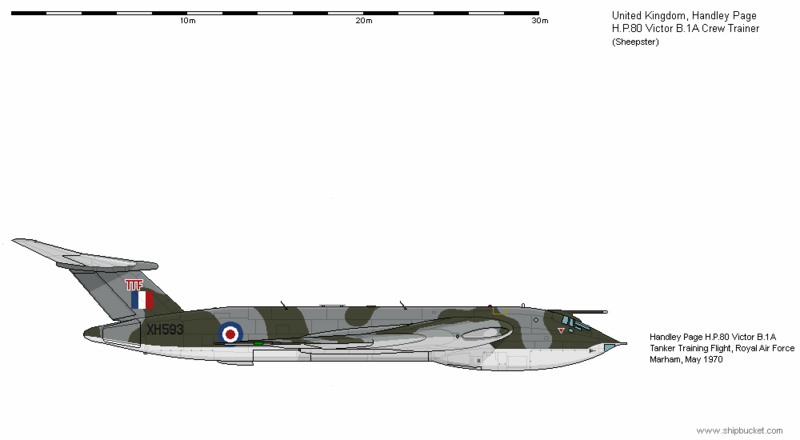 Before the whole fleet could be so painted, the Victor paint scheme was changed anyway into the low visibility hemp/light grey combination. The hemp paint chosen brought its own confusion, with the colour rapidly fading from the desert pink to a medium grey, leading some observers to conclude there was another grey-on-grey colour scheme. 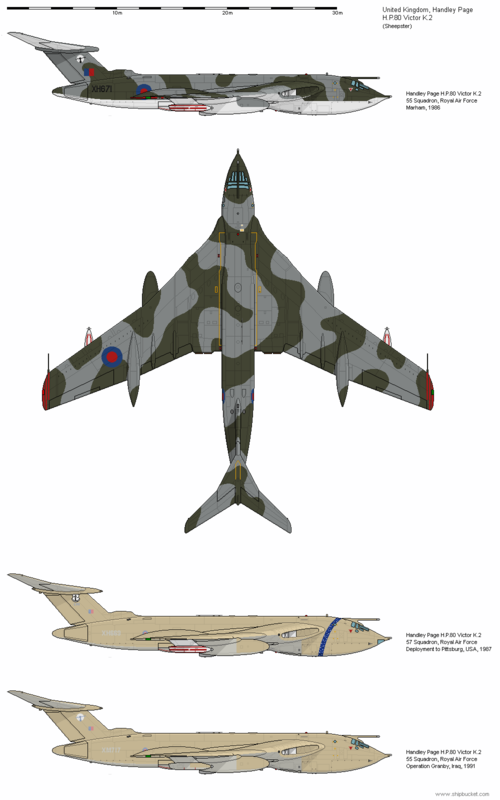 The Victor K.2 was the last serving model of the Victor, and performed as tankers for RAF and allied nations in combat operations, including the incredible ultra long-range multi-refueling Black Buck raids on the Falkland Islands. AN aircraft was deployed in the mid 1980's to the US and worked with the Pennsylvania Air National Guard, receiving a distinctive ANG star spangled colour band. 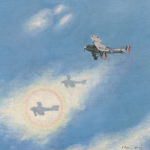 With the Iraqi invasion of Kuwait, the Victors were deployed to the Middle East to service Coalition air operations. The limited service life of the Victors was rapidly used up and by 1993 all Victors had been withdrawn from service, being replaced by the Tristar in the tanker role. Thanks for confirming the booster engine. As the last V-bomber to fly, the Victor was only required for very minimal testing of equipment for the V-bomber fleet, and only minimal testing of modifications to the Victor itself. One early series aircraft was used for testing of the slipper fuel tanks (the only Mk.1 aircraft to have flown with slipper tanks), dog-tooth wing droop and air-to-air refueling. A Mk.1 and a Mk.2 were also used for testing the Red Neck side-looking radar for the SR.2, and these seem to have been the only "odd-ball" test Victors. Even though the Victor had the largest bomb bay of the V-bomber fleet, HP proposed carriage of external bomb containers right from the initial aircraft submission. The standard 35x 1,000lb bombs carried internally would have been supplemented by an additional 10x 1,000lbs in each container. The bomb containers were never put in to construction, but were a potential for both the B.1 and B.2 Victors. An alternate bomb container system was modeled for the Mk.1 only, to be mounted under the engine nacelles. These could carry 6x 1,000lb bombs per container.